If you are travelling to Thailand for the first time, the whole experience can be a culture shock. What passes as normal in Thailand can be the sort of thing that is frowned upon in many countries in the West. 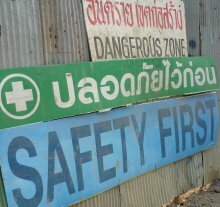 That’s an observation and not a criticism, but visitors should be particularly aware of the more casual approach that often exists towards safety matters in Thailand. There is a noticeably different outlook in Thailand towards life (and death). Combined with the more relaxed attitude towards rules and regulations, this actually forms part of the appeal of the country. Nevertheless, there are some areas where tourists should use some caution. Travelling on boats in Thailand is sometimes unavoidable. They can be a lot of fun and are a fantastic experience for tourists. They can also be overcrowded and provide no life-vests. Over the years, there have been numerous reports of overcrowded or poorly maintained boats running into difficulties. These stories normally only reach an international audience when foreign tourists are involved as has been the case with incidents for boats carrying passengers between Ko Samui and Ko Pha Ngan for the Full Moon Party. I’m not saying don’t use boats, but I am saying be aware of the potential hazards and make sure the boat you are on is carrying life-vests. There have been too many cases in the past where Thai boat operators have put profit before safety. Thailand’s roads provide arguably the most danger for locals and tourists. It’s the law in Thailand for motorcyclists to wear a helmet, but in many parts of Thailand that law isn’t always strictly enforced. Yes, it’s fun as a tourist to hire a motorbike and ride around a tropical island with the breeze blowing through your hair and the sun on your back. The aftermath of the numerous motorbike accidents I’ve seen involving foreign tourists isn’t quite so romantic. A lot of visitors to Thailand think its easy to ride a motorbike even if they have never done so before. After all, Thai schoolchildren can be seen whizzing around on motorbikes, so just how difficult can it be? Again, I’m not saying don’t hire a motorbike in Thailand, but be aware of the dangers. Unfamiliar roads and tracks with potholes can create problems for the most careful of riders. For pedestrians, don’t assume that cars will stop at a pedestrian crossing even if the traffic light is on red. They should stop, but I’ve seen it happen where cars actually speed up in an attempt to beat the red light instead of slowing down and stopping. In general, be careful of traffic coming from all directions and that includes one-way streets where motorcyclists in particular ignore the signs. Also be aware that motorcyclists sometimes use the pavement/sidewalk. Thailand isn’t a country where many people walk to get around; they use motorbikes or cars and there isn’t always a lot of common sense used on the roads. Eating at street-side stalls is one of the joys of visiting Thailand. Much of the food on offer is freshly prepared and cooked to order and it would be a shame for visitors to be over-concerned about health and safety matters and not sample the food which the locals eat. These stalls are often cleaner and more hygienic than they look. If a stall or restaurant is popular with locals, you can rest assured that the food is good and safe to eat. Speaking from personal experience, the times I’ve had an upset stomach in Thailand have usually stemmed from eating poorly prepared Western food or not drinking enough fluid so it’s been a case of som nam na (serves me right).